Here’s a quick and easy last-minute Christmas card! The Santa stamp and matching punch are from Stampin’ Up. I just love this santa from the Cookie Cutter Christmas stamp set with the punch to match – and the other images in the set are just as cute. Stamp Santa with black ink on white card stock, color with Copic markers, and punch out with the matching punch. Stamp your favorite sentiment with red ink on white card stock and punch with a scalloped oval punch. Emboss a piece of kraft card stock with your favorite embossing folder (this is a discontinued one from Stampin’ Up). 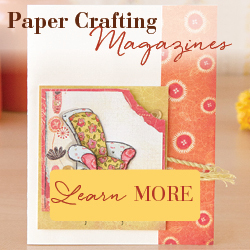 Attach a strip of patterned paper and attach the embossed piece to a white card. Attach Santa to the card with foam tape. Attach the sentiment to the card. Change the sentiment to “thank you” and you have a great thank you card for the wonderful Christmas gifts you’ve received.